Need to have reasonable estimations of how long a backup job will take, but ABR 10 is not providing accurate data in the job detail progress bar. I have seen in many threads over last year that there have been various permutations of the progress bar not indicating accurate or useful information. Acronis promised fixes in "next version" as per usual. I don't think it is fixed. I was long-time user of Acronis Echo Workstation, and earlier, and the progress indicator on those earlier versions would settle into a fairly accurate estimate of time remaining quite soon after a job started. I am using the upgrade to Backup and Recovery 10 Workstation, (help "About" shows Agent (build 10.0.12457 which is the latest release.) 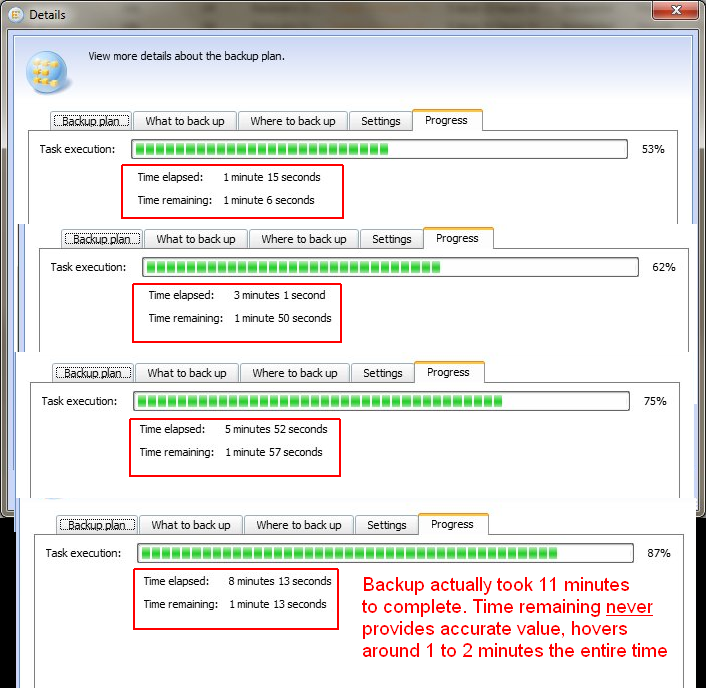 My backups do not register accurate Time remaining, see attached image, which is 4 screenshots of progress bar at different times, combined together. Regardless of whether I use an internal, local drive or an external (USB or Firewire) drive, the progress bar does not show correct information. Usually, on larger backups, the Time remaining simply increases in parallel with the Time elapsed bar, clearly never being able to determine an accurate estimate. This is not trivial. Does anyone, using ANY current verision of Acronis (Home or Business) have accurate Time remaining indications? This problem still exist in True Image 2016! I'm using Windows 10. Just started using Acronis and while I do like the application, this baffles me too. The estimate is just all over the place and just goes up and up. Except when its almost finished and still reports more than 30 minutes to go. And then it just finishes. Thank you for taking the time to share your feedback with us and welcome to Acronis Forums! Generally backup progress depend of: data size, available disk IOPS, available HW and bandwidth resources. Since backup process is more like creating a ZIP archive, then accurate time estimation depend even on zlib algorithm, where compression is used. ( KB https://kb.acronis.com/content/16791) With lots of factors involved it's not always possible to show the accurate estimation, though the product team is constantly working on improvements in this field.